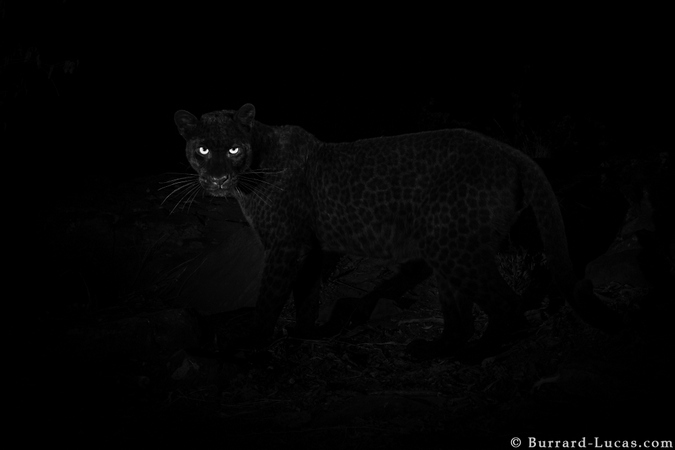 Then, a couple of years ago, photos started emerging of a black leopard in India. It was a cat that had made its territory in the tourist area of Kabini Forest in Karnataka. 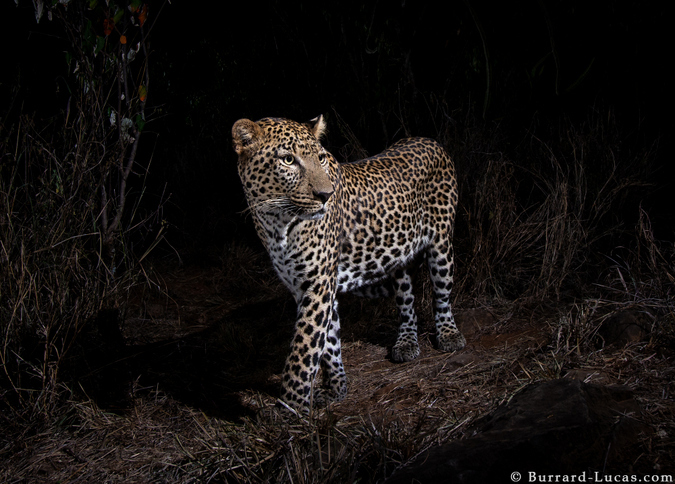 The leopard was hard to see but some persistent photographers managed to capture images of it that got my pulse racing. Then, by chance, I was asked to speak at the Nature in Focus Festival in Bangalore last September. I took this opportunity to spend three days searching Kabini Forest for the famous cat. The festival organisers arranged for me to be guided by Giri Cavale, a photographer whose knack for finding the elusive black panther is legendary. I didn’t have high hopes of seeing it in such a short period of time but as we explored the forest it was thrilling just to know the cat was out there. Then, on the second day, we managed to spot the black leopard crossing the road in front of us! It was far away but I was enthralled and managed to capture the image below. The lucky encounter ignited my imagination and I dreamed more than ever of finding and photographing one of these stunning cats in Africa. 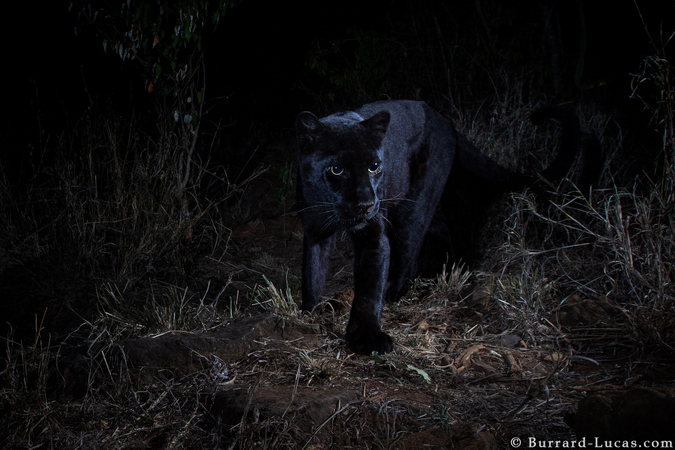 I have never seen a high-quality image of a wild black leopard come out of Africa, even though stories of them being seen are sometimes told… “a friend of a friend saw a black leopard crossing the road early one morning”. By chance, around the time of my India trip, my friends James and Abigail from Ker & Downey told me one such story – that a black leopard had been seen up at Laikipia Wilderness Camp in Kenya. My ears pricked up and I contacted the owners Steve and Annabelle Carey to find out more. Steve confirmed that it was true and he had seen several black leopards over the years. That was enough for me and I decided to invest some time in checking it out. On arrival in Laikipia, Steve took me to meet Luisa Ancilotto who lives close to the camp and had seen a black leopard recently. She told us as much as she knew about the leopard’s habits and territory. Then Steve managed to pick up some fresh leopard tracks nearby and followed them to a path that leopards seemed to be using. 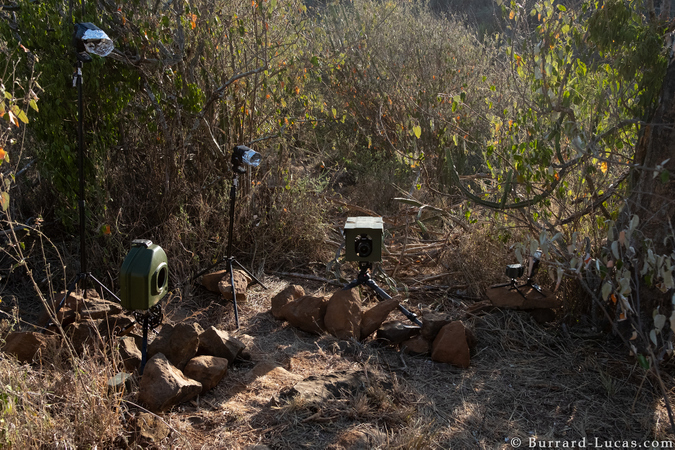 I deployed a plethora of camera traps each consisting of a Camtraptions wireless motion sensor, a high-quality DSLR camera and two or three flashes. 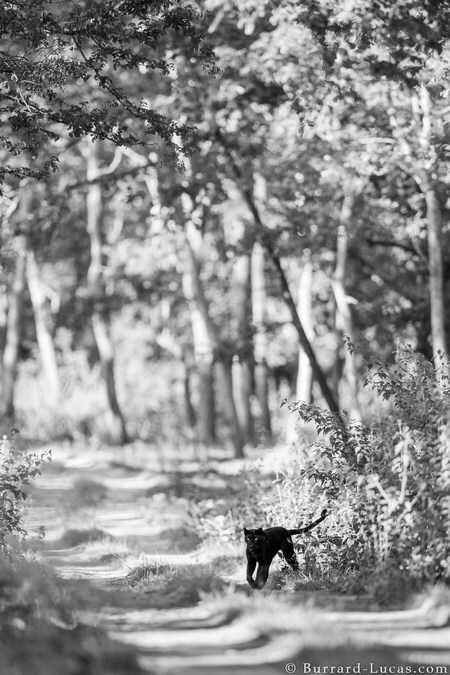 I had high hopes of photographing a leopard, but would it be black? The next day I eagerly checked the cameras but had no images of leopards. I was disheartened and suddenly felt the enormity of what I was trying to achieve. 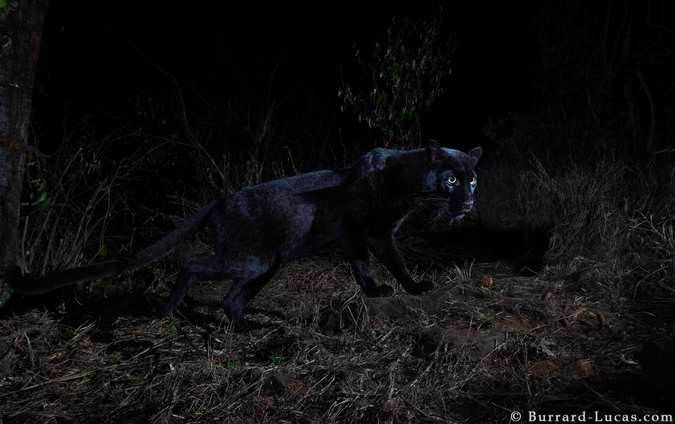 Surely I was not going to be lucky enough to actually photograph a melanistic African leopard?! I left the cameras for several more nights. On returning, I checked them and by the time I got to the last camera, all I had seen were pictures of hyenas but no leopards. I had a quick look at the last trap, not expecting to find much. 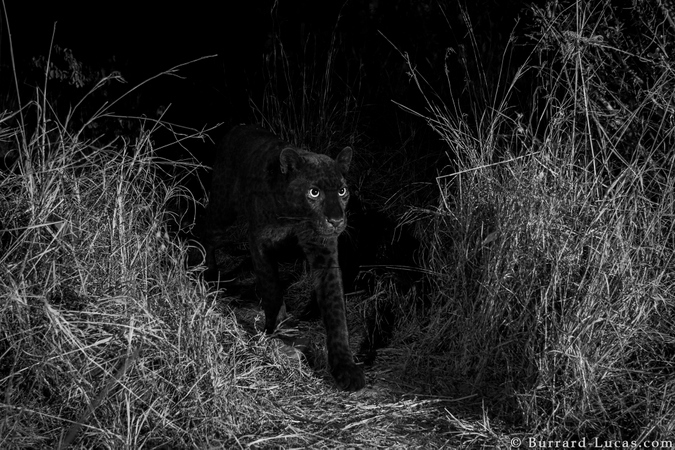 As I scrolled through the images on the back of the camera, I paused and peered at the photograph below in incomprehension… a pair of eyes surrounded by inky darkness… a black leopard! I couldn’t believe it and it took a few days before it sank in that I had achieved my dream. Over the days that followed I moved the camera traps around as I gained a deeper understanding of the leopard’s movements. The next hit I got was further down on the same game trail as the first capture. I love the way this cat melts out of the darkness! The spotty male hung around for what felt like an age and I began to think that the black leopard might never return. During this time I checked my cameras daily and often had images of striped and spotted hyenas as well. 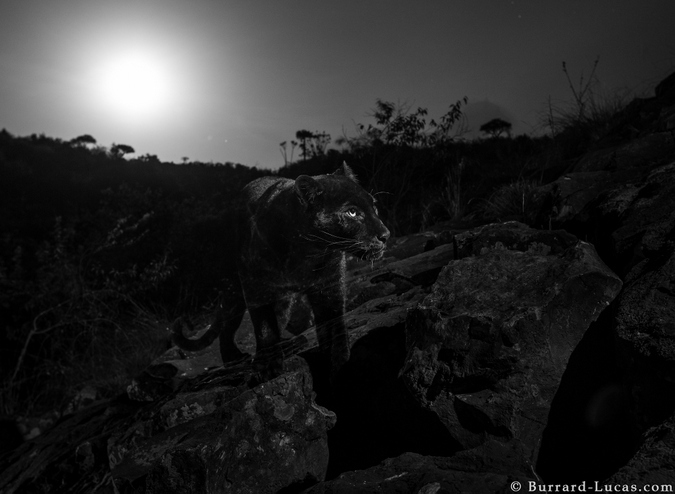 Then, on the night of the full moon, the black leopard reappeared and I captured the shot below as the moon was setting behind a ridge. Needless to say, I was thrilled that he was back and that I had captured such an atmospheric image. As far as I know, these are the first high-quality camera trap photographs of a wild melanistic leopard ever taken in Africa. I can still scarcely believe that this project – which started out as a speculative recce trip – has paid such spectacular dividends! A big thank you to Steve Carey from Laikipia Wilderness Camp and Luisa Ancilotto, without whom I never could have found and photographed the African black panther. Update: For clarification, I am not claiming that these are the first photos of a black leopard taken in Africa. 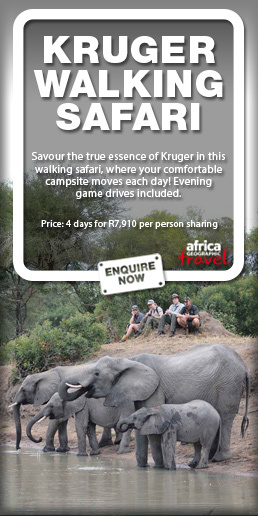 I do however believe that they are the first high-quality camera trap photographs. The headline, “first in 100 years,” is derived from a quote attributed to scientists from San Diego Zoo stating that my images, in combination with their video footage, constitute the first scientific documentation of such a creature in Africa in nearly a century. This was first published by National Geographic but was misinterpreted as meaning “the first photos taken in 100 years” as was subsequently reported by many media outlets. I hope this blog post and update clears up any confusion and I appreciate that this error has now been corrected in a number of articles. I will soon be heading back in an attempt to capture more images, please follow @willbl on Instagram for more photos and updates. Will Burrard-Lucas is a professional wildlife photographer from the UK. He uses innovation and technology to achieve fresh perspectives in his work and is the founder of Camtraptions.